Migration of MyRapid cards can be done at all Monorail, BRT and LRT stations except Abdullah Hukum LRT Station. 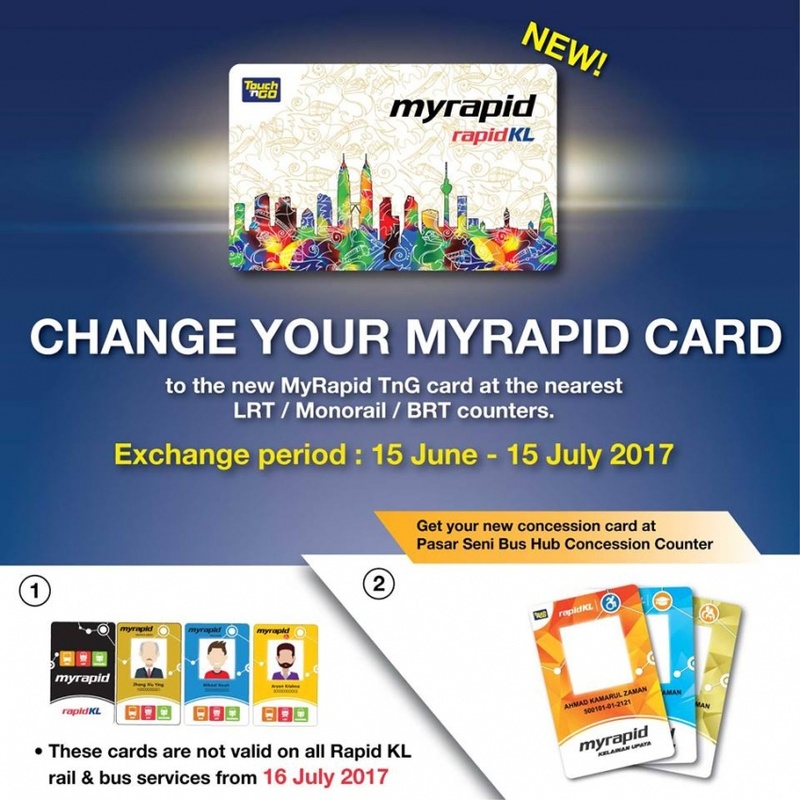 KUALA LUMPUR, 14 June – With the full opening of the MRT Sungai Buloh – Kajang Line on July 17, MyRapid card users are requested to change their cards to the new MyRapid Touch ‘n Go (TnG) cards by July 15 to allow seamless travels between the new MRT line and other Rapid KL rail and bus networks. “Rapid KL has allocated a full month for all MyRapid card holders to change their cards and migrate to the new MyRapid TnG platform. The migration exercise starts tomorrow (Thursday, 15 June) and closes on 15 July. With the new MyRapid TnG cards, commuters can access and travel seamlessly to all Rapid KL services – buses, LRTs, monorail; and the MRT,” Prasarana Malaysia Berhad (Prasarana) said in a statement today. 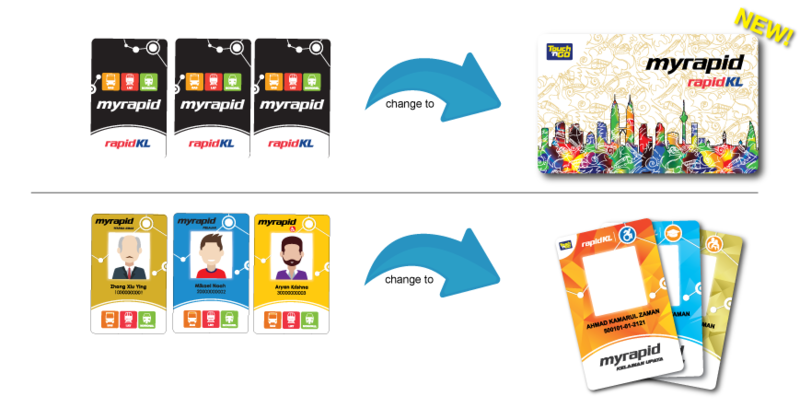 The current MyRapid card will cease usage after 15 July, the statement added. The migration exercise covers the normal MyRapid cards and MyRapid concession cards, including those for senior citizens, students and the physically-challenged or OKU. “For the normal MyRapid cards, customers can migrate their cards at all Rapid KL Customer Service Offices (CSO) at LRT, Monorail and BRT stations, except at Abdullah Hukum LRT Station. The migration exercise can be done during the operational hours of the stations. “For the concession cards, the replacement can be only done at the concession card counter at the Pasar Seni bus hub as it requires card holders to fill in the relevant forms and for their photos taken for identification,” said Prasarana’s spokesman, Lim Jin Aun. Migration to the new MyRapid TnG cards will be done at no charge; with the balance in the current cards transferred to the new cards. However, the balance will need to be rounded up to denomination of RM5 as the system is set as such. “Hence, for example, if the balance in the current MyRapid card is RM 2.50, you will need to reload another RM 2.50, to make it RM 5.00. If it is RM 13.70, you will need to reload RM 1.30, to make it RM 15.00. And, if the balance is RM 17.00, you will need to reload RM 3.00, to make it RM 20.00. Reloading can be done at the CSOs,” added Lim, who is Prasarana’s Head of the Group Communications and Strategic Marketing Department. For MyRapid card users who subscribed to the Smart 7, Smart 30 and MyRapid Bus 30 packages, they can still continue to enjoy the same benefits with the new MyRapid TnG cards. “However, subscribers under these packages cannot migrate the remaining days. Hence, we strongly advise the subscribers to finish up the remaining days before migrating to the new MyRapid TnG card,” he said. For usage of MyRapid Card at the Park n Ride facilities in Gombak and Ampang LRT stations, card users can still enjoy the flat rate of RM4 per entry at these parking facilities when taking the LRT, Monorail and the BRT using MyRapid TnG cards. “However, the Park n Ride facility at the Ampang LRT Station is currently open for free until September 2017,” added Lim. Commuters can get full information on the MyRapid card migration exercise at the Prasarana official website at www.myrapid.com.my. Alternatively, they can write to suggest@rapidkl.com.my or call the Rapid KL contact centre at 03-7885 2525 during office hours for further enquiries.